The Fulfilling the Promise for Generations of Women Campaign officially concluded on June 30, 2013 and we surpassed our $8 million goal! In 2007, The Ursuline School launched its largest and most comprehensive fundraising effort. The Campaign was launched in response to structural damage sustained by the South Building that required “emergency surgery” costing $4 million. This became the first pillar of The Campaign for The Ursuline School. An additional $4 million goal was added to support three additional pillars of the Campaign; the second pillar was endowment for Scholarships and Financial Aid, the third pillar was Faculty Professional Development and Curriculum Enhancement, and the fourth pillar was the Turf Athletic Field (Kelly Mac Field). 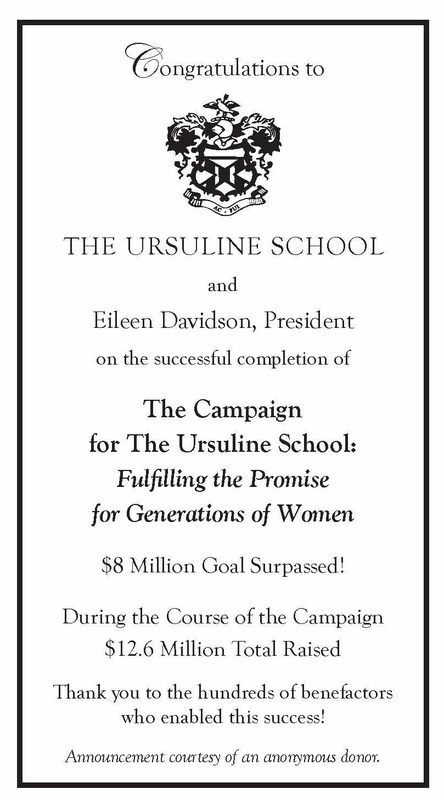 The Campaign successfully set the stage for continued development of a culture of philanthropy at Ursuline. The Campaign’s many accomplishments resulted from a collaborative effort led by a talented and dedicated Cabinet comprised of alumnae, current parents and alumnae parents, Administration and friends. Donations and pledges, large and small, were critical to our success. Campaign events raised awareness and funds while creating excitement that bonded us as a school community. Mr. and Mrs. James Sullivan, Sr.
William T. Foley Foundation, Inc.
Mr. and Mrs. N. Theodore Zink, Jr.
June 30, 2011 raising a grand total of $411,580.